﻿﻿ After Roosevelt's overwhelming election, a rather contentious relationship developed between the president-elect and the outgoing Hoover administration, which continued to follow its cautious fiscal policy in the months of the protracted transition period from November to March until the new president was inaugurated. The delay in the transfer of power also led to calls for a shorter transition, which would ultimately lead to the approval of the 20th Amendment to the Constitution changing the inaugural date to January 20 following the presidential election. 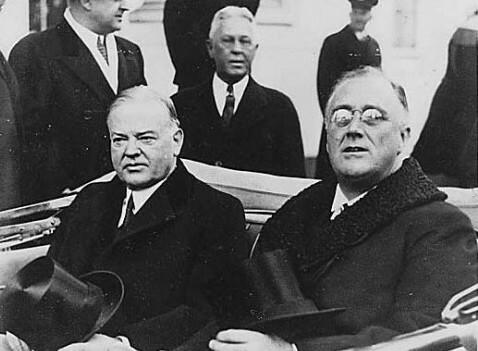 Roosevelt's Inaugural Address on March 4 sought to reassure the public's confidence in the economy and its institutions, focused by his famous phrase "...the only thing we have to fear is fear itself." ....So, first of all, let me assert my firm belief that the only thing we have to fear is fear itself—nameless, unreasoning, unjustified terror which paralyzes needed efforts to convert retreat into advance. In every dark hour of our national life a leadership of frankness and vigor has met with that understanding and support of the people themselves which is essential to victory. I am convinced that you will again give that support to leadership in these critical days. ﻿The rapid pace of proposals offered during the first "hundred days" of the Roosevelt Administration set an informal benchmark for measuring the records of subsequent new presidents. The program included massive building projects, such as dams and hydroelectic power developed through the establishment of the Tennessee Valley Authority, and extensive regulation of business and labor by such new agencies as the National Recovery Administration (NRA) established under the National Industrial Recovery Act of 1933. A key component of the programs were codes that business and labor were directed to adopt on how specific industries would manage prices and wage levels that would be submitted to the NRA for approval. ﻿ Roosevelt also continued to talk directly to the public through radio, with his first of several Fireside Chats discussing the banking crisis broadcast on March 12, 1933, just eight days after he took office. In May, he gave further details of his other New Deal programs. By 1935, some measure of recovery was apparent, but opposition continued to the New Deal's extraordinary intervention in the economy and the surging federal deficits. In May, 1935, in the case of Schecther Poultry Corp. v. United States the U.S. Supreme Court invalidated the compulsory-code system as it regulated the poultry industry on the grounds that the legislation establishing the NRA was an unconstitutional delegation of legislative powers to the executive and that the provisions of the poultry code did not constitute a regulation of interstate commerce. Subsequent decisions by the Court also held that other components of the New Deal were unconstitutional. The Court in addition to the proper use of its judicial functions has improperly set itself up as a third house of the Congress - a super-legislature, as one of the justices has called it - reading into the Constitution words and implications which are not there, and which were never intended to be there....What is my proposal? It is simply this: whenever a judge or justice of any federal court has reached the age of seventy and does not avail himself of the opportunity to retire on a pension, a new member shall be appointed by the president then in office, with the approval, as required by the Constitution, of the Senate of the United States. Despite the President's efforts, the plan attracted sharp criticism in the course of Senate Judiciary Committee hearings held later in March. The Court also began to rule in favor of the Administration in some sharply disputed cases, thus undermining Roosevelt's argument that the Court was biased against reform. By June, Roosevelt was forced to agree to a proposed compromise that would allow him to name just two new justices; however, this proposal lost support when the Committee issued a report calling the plan "a needless, futile and utterly dangerous abandonment of constitutional principle … without precedent or justification." Democratic Majority Leader Joseph T. Robinson, the President's prime advocate for the legislation, also suffered chest pains shortly after the Senate floor debate began on July 2 and died on July 14. On July 22, the Senate voted 70-20 to send the measure back to committee, where all the controversial language was deleted. The Senate passed the revised legislation a week later, and Roosevelt reluctantly signed it into law on August 26. Soon, the composition of the Court also changed with the retirement or death of the older justices. In 1937, Roosevelt named Senator Hugo L. Black; in 1938, Solicitor General Stanley Reed; and in 1939, Harvard Law Professor Felix Frankfurter and Chairman of the Securities and Exchange Commission William O. Douglas. By 1941, the President had appointed seven of the nine justices, and the philosophical shift of the Court to support government intervention would continue through at least three decades.